Some say footwear is the first thing people’s eyes fix on – but we’d argue hair is up there too. And, unlike a pair of subpar brogues or some battered white leather trainers, you can’t easily slip out of a questionable hairstyle. So it pays to get acquainted with the classic cuts that work for you, and that won’t fall hopelessly out of favour six months down the line. “First things first, you’re going to need a good bit of length in your hair before you schedule a cut for a style like this. Also worth noting is that this textured style works best with thicker rather than fine hair, and if you’re receding, then this isn’t the style for you. “Guys with double crowns or cows licks should definitely consider the textured look as it’s a style that generally lets your hair lie the way it wants to. It’s best not to battle against these hair quirks. “When it comes to achieving the textured look, I’d recommend bringing a picture [try saving one to your smartphone] with you to demonstrate exactly the type of cut you want. A good barber will be able to tell you from the picture if it’ll suit you and your hair type. “One thing to watch out for when you’re having your hair cut for a style like this is thinning scissors; a lot of barbers tend to get trigger happy with these, but they should never be used on the top of the hair as they can make ends wispy and hair at the root excessively bulky by comparison. Instead, point cutting and razoring (using a straight edge razor) should be the techniques used. “The French crop suits most face shapes and is ideal for men going thinner on top. Since you’re taking the hair forward slightly here, leaving length in the fringe, it can help to cover any receding patches. “It’s a low maintenance, easy in-and-out style – perfect for someone in and out of the gym or swimming pool – as you can wear it without styling product, just letting it fall naturally into place. “The buzz cut is a timeless style. But to really make it work, you need to have a great shaped head [a noggin like Ryan Gosling’s or Christian Bale’s, for example]. “Go for a shape that is slightly square over all [clippered at the sides], with a little more length on the top. Scissor over comb is the Pankhurst technique and I’d highly recommend you make sure your barber uses scissor over comb rather than clippers exclusively. By cutting, you can work with the shape of the head to make the overall cut more flattering. “A good barber will take everything he knows about you into account, from your personality to your style to your day-to-day living, to provide a cut that suits you. Remember you wear your haircut 24/7 so it needs to work for all scenarios. 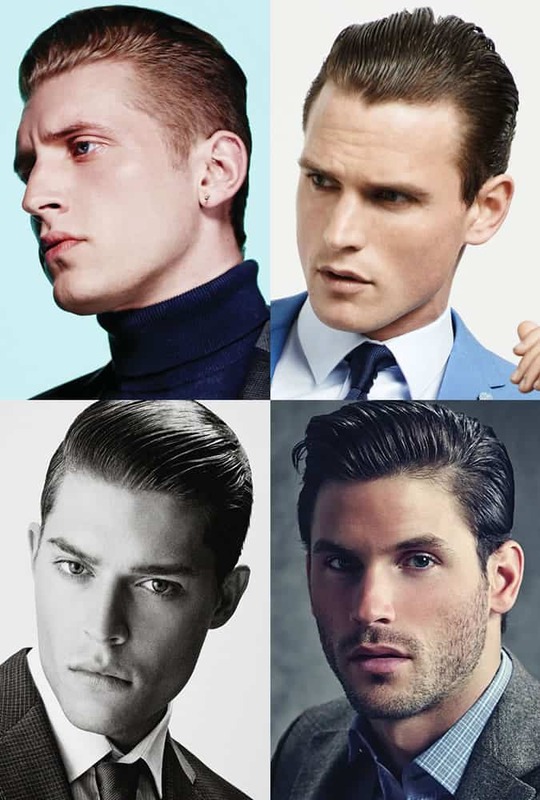 “The modern slick back first made an impact in the 1920s. At the time, it was useful to have a hairstyle that wouldn’t be messed up when wearing a hat (a status symbol and indicator of one’s class around the early 20th century). Since then, it has become a timeless classic. “Straight hair is best for this – the more curl you have, the harder it is to slick back properly. As for what face shape suits this style, it’s pretty versatile, as it will allow facial features (like beards, moustaches) to be more prominent, with the hair essentially framing the face. Unfortunately, for those with a receding hairline, the slick back look won’t be ideal as it’ll make recession far more prominent. “The back and sides need to be tapered, natural and fairly tight, with a graduation up to the slightly heavier top. If you’re going for an undercut, there needs to be a disconnection here, but blending would be a better option for finer hair. “Particularly popular from the 1920s-1940s and again in the 1960s, this style has been revived in the last decade as an easier-to-achieve alternative to the slick back. “As the basis of the haircut is a simple short back and sides, the style is pretty versatile and will suit most hair types and face shapes. That said, this can run the risk of looking like a comb-over if hair is too long and thin on top – definitely not a good look – so bear that in mind before your cut. “Ask for a classic taper on the back and sides, and for the top to be left long enough to part, but short enough to be neat and tidy. “The styling product you should use depends on your hair density: those with thicker hair should try a paste, while a matte clay works best for finer, less dense hair types. “Actually parting the hair can be tricky; the best approach is to put the product in the hair when damp (not wet) and part using a comb. You should try to establish where the natural parting is, perhaps with the help of your barber initially. “Classic and refined, this style has featured in fashion for years, versatile enough to be adapted to several situations. By keeping your hair longer and having your barber or stylist add in some layers, you can just as easily have a beach-ready textured look as a Gordon Gecko boardroom look. “Probably the toughest part of achieving this style is growing your hair – and if you’re having difficulty, persevere. There will always be a day when you can’t stand it and want to cut it all off but – before making any rash decisions – try setting a goal length and make a decision once your hair’s grown to that length on whether or not you want to stick with it. “When it comes to getting your hair cut, take time to discuss with your barber or stylist, making sure you mention what your limitations are. There’s no point having a messy, choppy layered look when you have to appear smart and put together for work. “The success of this style is dependent on hair texture. Very straight hair won’t stay in place as easy as hair that has a subtle wave; equally, excessively curly hair will be difficult to keep smoothed out. “By consulting with your barber or stylist about your options, you’ll discover that there’s always a way to cater to your particular needs. For example, a loose perm (it’s moved on a lot since Kevin Keegan) might be the solution for straight hair, while a texturiser could soften very curly hair and make it more manageable. “Two words: Will Smith. The Fresh Prince paved the way for the popularity of the shaped afro, giving rise to variations and interpretations like this alternative take on the classic hi-top fade. “This isn’t the most versatile look as it’s designed to stay in the shape that it’s been cut, so there’s not much room to change it up. Also, afro or extremely curly hair is essential. “Before your cut, make sure you take time to discuss with your barber or stylist the degree to which you want the shape of your afro to point out; getting this part right is crucial so that you can brush it into shape easily. “There are so many different variations on this style so it might be worth taking some images of styles you like with you to your haircut. Guys often feel embarrassed taking pictures with them but the more insight the person cutting your hair has, the better. “The pompadour has been popular in many different lengths and variations since its original debut, on Madame du Pompadour, chief mistress to the French King Louis XV in the 1750s. Initially a feminine style in which all the hair was pinned up onto the top of the head to create height and drama – the style has morphed over hundreds of years into the wearable styles pictured below. A hairstyle with hundreds of years of history? You can’t get more classic than that. “The pompadour works for most but does require some degree of thickness to the hair so that the style can support itself once created. Additionally, different face shapes can be flattered by varying the style’s structure. 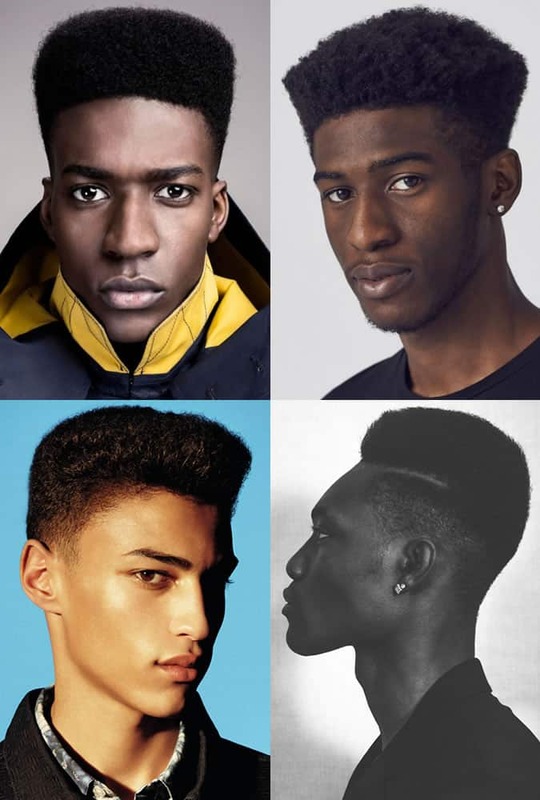 For example, if you have a narrow face shape, you could wear your pompadour wider and softer, or if you have a round face, it’s worth slicking the hair at the sides of your head right down to slim the overall silhouette. “To get this style, you’ll need to start by growing the front out bit by bit – get your barber or stylist to cut in a graduated top for you. Then, each time you have your hair trimmed the graduation should be altered slightly to retain all the length at the front, while keeping the back shorter. “Once you’ve grown three inches of hair at the front, you’ll be able to create height when you style your pompadour by using a hairdryer and a mousse or salt spray. Pull the hair up as you dry it to create rootlift. Once nearly dry, use your fingertips, or a round/Denman hairbrush to give the ends some movement, allowing the style to be pushed back on itself. “It’s worth experimenting with products to find the best fit but avoid overloading your hair with product in one fell swoop. Add your product to the back and sides before working through the top – remember you can always add a little more in, but you can’t take any out without washing. “A less polished alternative to the pompadour, the quiff is an iconic style that suits a wide range of ages, face shapes and personal styles. Like the pompadour, though, the quiff isn’t best suited to those with receding hairlines as it exposes the forehead. “Before your cut, make sure you’ve decided whether a classic or contemporary take on the quiff works best for you (with the help of your barber or stylist, of course). The classic quiff features a softer back and sides which are kept short, but not severely so. The contemporary take, however, can feature a dramatic contrast between long hair at the top of the head and a tightly clippered back and sides, producing a ‘disconnected’ effect. Note: the longer your hair, the longer it takes to style. “Face type is also important: since the quiff offers natural volume, it’s best not to take the hair at the sides and back too short if you have a long face. “To style, apply a wet styling product to towel dried hair and comb through to evenly distribute. Then, blow-dry the hair using a hair dryer set to the highest temperature setting and the lowest speed, while simultaneously using a vented brush to sweep the hair into your preferred shape. Which of these styles would you select, or have we missed out on your old faithful? Maybe you have some sage-level styling tips to share?